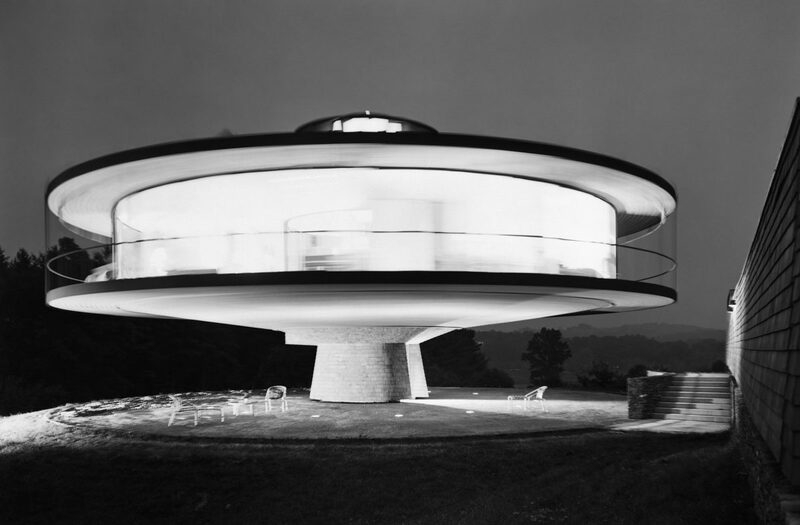 For awhile, well-known architect Richard Foster thought he would have to use ship-to-Shore telephones in his unique revolving round house being built in Wilton, Conn. But that was only one of the, engineering challenges — water, electricity, heat and waste diSposal, too, presented dilemmas in a rotating house. The glass and steel house, 72 feet in diameter, rests on a core of precast concrete that is 12 feet high. It will rotate . from nine inches to five feet a min-ute on the outer periphery with an infinite’ variety of speeds in between above a three-ton ball bearing assembly. The bearing, 14 feet in diameter, is set in a raceway above the core. Power is supplied by a 1.5 h.p. electric motor. “Mounting it on the ball bearing proved to be about the easiest task so far,” Foster ex-plains. He was well bolstered in the event of difficulties as his cause had attracted many interested engineers at nearby electronics plants who had offered their services. “But this is the first time I’ve ever been involved in a rotating house. I don’t even know of another,” explained Foster at the site. He is playing the project more or less by ear, making drawings as he goes along. He and one man, German contractor William Mewing of Larchmont, N.Y., have been doing the house together. They call in help when it is needed. Foster works on weekends when he also makes decision—telephone and electricity will go an trolleys that have swinging joints; water will be piped to the roof. Now they are building cement troughs in the round hoping it will be the answer to waste disposal. 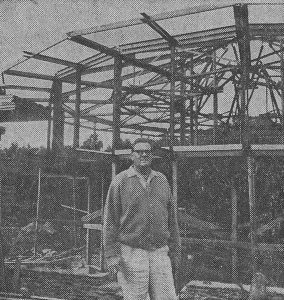 Richard Foster on site at the construction of his Round House – 1967. Foster believes that all houses should be planned to take advantage of the sites that they are to be on. He was so impressed with this four-acre site that he couldn’t quite make up his mind about the house that would ‘suit it best. The round house is his fifth. The Fosters can go to bed looking down a long vista toward the sunset, if they like, and wake up to see the sunrise overlooking ponds, evergreens, rock walls or statuary-dotted landscape. It will be a quiet house with no vibration. Forty-five tons of rusting steel have gone into the house. Its truncated cane-shaped ceiling and: entrance door through a core, shaped like a-tree trunk makes it look like a giant mushroom at this stage. A circular stairway leads to nine. rooms sat in the GO-foot diameter living area. Glass panels between steel columns are to be set in aluminum frames, every other one sliding. There is a veranda on the outer periphery. The entrance core, roof area and sofits will be finished in silver-bleached cedar shingles. Foster likes the fluidity of form that shingles permit. Foster lives with his wife and three sons, who are now away at schools, in a house not far from the new one.